Launch them and bring them back safely is what we were taught in the US Navy and this holds true to our relationship with Bath Iron Works in our capacity to provide around the clock availability in support of diving operations. JMS’ safety record speaks volumes about our performance with our customers and the accountability that we always strive to provide. This year more so than in others, the importance of fiscal prudence is a subject to expound on with respect to its interrelationship with the subject of safety and the ability to reach acceptable and prudent task completion without sacrificing or embellishing bonafide needs. As we look around daily we are reminded of the fine line that needs to be threaded to remain professional and trained but at the same time frugal and affordable. No amount of money can atone for bad judgment when it comes to safety. JMS has been providing on-site supervision and project management supporting all diving operations at Bath Iron Works for the past 16 years. This past year, underwater operations once again supported the manufacture of new Arleigh Burke class destroyers and the shipyard infrastructure to launch and maintain these modern and highly sophisticated warships. 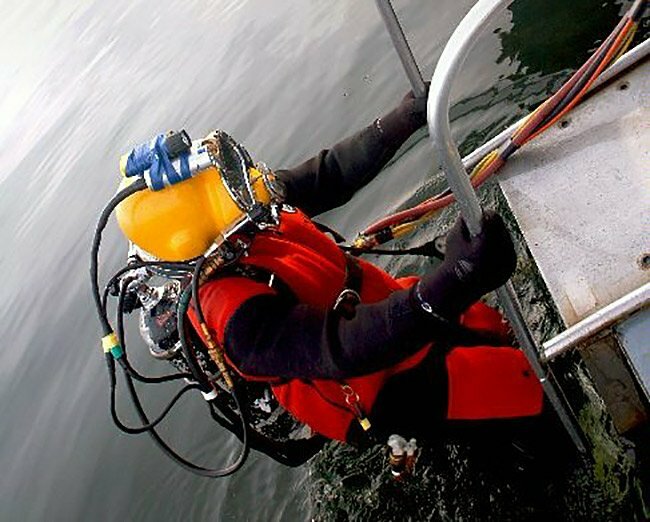 Diving services at Bath Iron Works are provided by local 6 representatives who are temporarily assigned to the dive team on a rotational basis from their respective primary departments. Prudent planning allows for most dives to be accomplished during warmer weather months but nevertheless, the dive team does get called on to accomplish tasking in the worst possible environment with ice flows and currents to contend with. 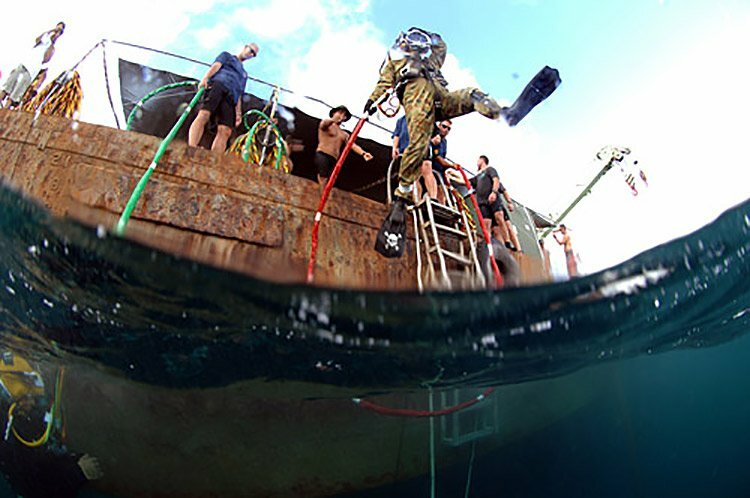 Surface supplied diving with hot water suits is the preferred method of performing these tasks but on occasion scuba with dry-suits and through the water communications has been the only method to accomplish the needed tasking. This year saw the delivery of two Arleigh Burke class destroyers to the US Navy; USS SAMPSON DDG-102 and USS STERET DDG-104. Two civilian sulfur carriers were successfully converted with the bows cut off and new ones added along with the installation of keel coolers, forward and after bow thrusters and 4 each auxiliary propulsion units. Currently the USS STOCKDALE DDG-106 is alongside pier 3 having completed its first underway INSURV inspection with flying colors and most recently the USS MEYER DDG-108 was launched from the 28,000 ton lift capacity floating dry-dock. All of these ships were finally assembled on one of 3 building ways on the 15-acre land level transfer facility and moved to the floating dry-dock by means of an electro hydraulic transfer rail system. The 3 building ways are each designed to support the assembly of ships which are up to 243 meters in length and a maximum beam of 32 meters. Two track mounted 300 ton luffing cranes and one 100 ton luffing crane support the assembly effort. In addition there are two outfitting piers adjacent to the land level transfer facility serviced by a track mounted 90-ton and a 60-ton luffing cranes. In addition to the land level transfer facility the shipyard has 3 inclined ways serviced by a 220-metric ton track mounted luffing crane. Due to the range of weather the ships are built in modules/units inside buildings and then further assembly of large modules/units up to 1500 tons can be accomplished out of the weather in the recently completed MEGA Unit facility. The large modules/units are then transferred to the land level transfer facility where the ships are finally assembled and ready for launch into the Kennebec River. 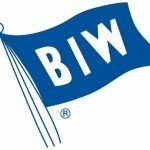 We remain committed to our relationship with Bath Iron Works and look forward to providing another year of safe and professional service to this endeavor.